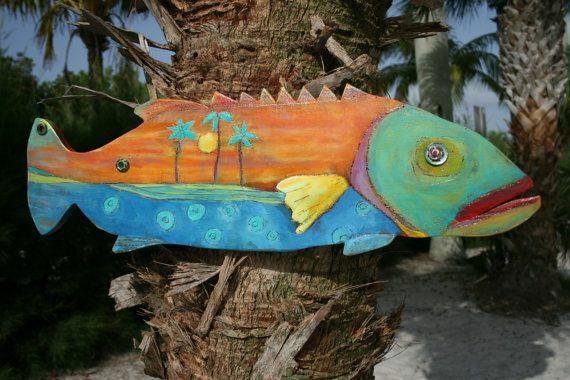 Goliath Grouper is carved and painted on 1/2 pine. Look closely his eye is a flattened bottle cap layered with a lampwork glass bead. I make the beads in my studio. He is wired on the back and ready to hang. With his glossy protective top coat you can hang him indoors or outside on the tiki hut! The Goliath Grouper measures approximately 9 H x 30W. Every fish is signed and numbered on the back.